Making art and craft projects with your little one is such a fun experience…but it can be very messy, or complicated. I love letting my child explore materials for a sensory activity while also getting a one-of-a-kind piece of art to cherish. I also know there are a bunch of parents cringing at the thought of taking out all those art supplies, finding a place to set up, and probably putting down a tarp in preparation for a mess. 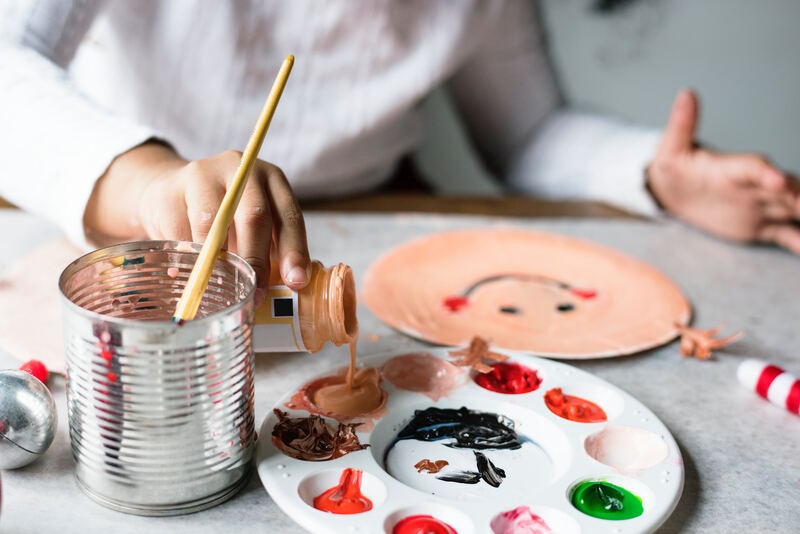 Now there is no real solution to ending the craft mess, but here are a few “hacks” to possibly help relieve some mess and stress of art projects with your little one. 1. Dish Soap in Tempera Paint. Paint is a messy experience; whether by brush or my finger (lets face it, it becomes a full body experience). Even after you bathe your mini-Picasso, there is still leftover color that seems to stain the skin. Before you paint, place a few drops of dish soap in your paint pots. It is not 100% guaranteed to “stain” those fingers, but it makes it easier to wipe away mess. 2. Paint in a Bag. If you really hate paint, or your infant cannot stand the feeling of paint try placing a piece of paper with a few drops of paint into a plastic bag you can zip close. They can “smoosh” the paint with no mess. The mess does come later when you take the paper out to dry, but it is minimal. 3. Glue and Paint Mix. This is not a less mess “hack” but an efficient one. Mix some glue with the paint/paints of your choice before starting your project; this is definitely a paint brush worthy mixture. Not only can your child paint, but they can layer collage pieces at the same time. No need to wait for the paint to dry before gluing. 4. Glue and Glitter Mix. Speaking of glue mixtures, mix in glitter. Kids love glitter, but it gets everywhere. By mixing it with glue before they start, you eliminate the pile of loose glitter that is impossible to vacuum up. 6. Glue Dots. These pre made dots are sticky on both sides; they are small and strong. You can turn anything into a “sticker.” This eliminates the use of glue and is a great alternative to the little ones that are overwhelmed by large spaces of sticky textures. These are just some ways to tone down the mess of art time.